Is Kim Jong-un's Aunt Dead? North Korean leader Kim Jong-un's aunt and widow of executed eminence grise Jang Song-taek is believed to have died, possibly by her own hand. A government source here on Sunday said Kim Kyong-hui, who has been out of the public eye either committed suicide or died from a heart attack. The source said intelligence services here believe Kim is dead but have not been able to confirm this, though they are also trying to find out whether she went abroad for medical treatment. Another government official said, "There are many rumors going around about Kim Kyong-hui, but we're not yet able to confirm any of them." 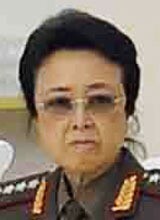 Kim Kyong-hui is former North Korean leader Kim Jong-il's only sister and the daughter of nation founder Kim Il-sung. She was last seen at the 65th anniversary of North Korea on Sept. 9 of last year and with Kim Jong-un and his wife Ri Sol-ju at a musical performance on Sept. 10. Despite the execution of her powerful husband, her name was on a list of dignitaries planning the funeral for a high-ranking Workers Party official who died in mid-December, so intelligence services here believed she was alive and well. But she did not show up for the second anniversary of the death of Kim Jong-il on Dec. 17, raising speculation that she was ill or forced into isolation. Born in 1946, she is 68 this year and apparently suffered from alcoholism and depression due to her troubled marriage with Jang and the suicide of her daughter in 2006. She went to Moscow in 2011 for medical treatment. A government official said, "It is clear that Kim Kyong-hui received medical treatment on her toe and there are rumors that she was also treated for heart problems or dementia." Other rumors said she received medical treatment in Singapore in 2012.